Join us to make a difference for neighbors without enough to eat: children, the elderly, the disabled, and the unemployed. We are an all-volunteer organization providing food assistance to more than 750 low-income households per month through the work of local churches, community volunteers and farmers. Please consider a small monthly donation to make sure we can share with our hungry neighbors. We are growing! For our annual 'special' holiday distribution, 768 families received food in December 2014; and 792 families received food in December 2015. We have also been able to minister to the spiritual needs of many of these same individuals. Just as encouraging, more than 100 volunteers donated their time during the month of December to make this possible. None of this would occur without your financial donations. Harvest of Hope Food Pantry is now able to provide food and hope on a regular basis for members of our community who are currently experiencing difficulty. 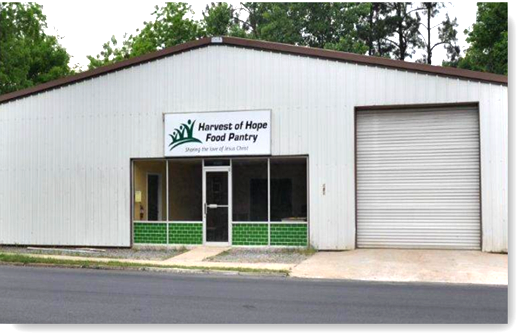 All contributions made to Harvest of Hope Food Pantry are used to provide goods and services for qualified recipients and to maintain and operate the facility. There are no paid staff – all labor is voluntary.